Arriving at Favola one evening, we found or seat along the main table, next to Axel Vade Pruzzo, the Chilean Export Manager for De Martino wines, in charge of Asia. We starting talking and he began to tell us the story of this amazing vineyard. 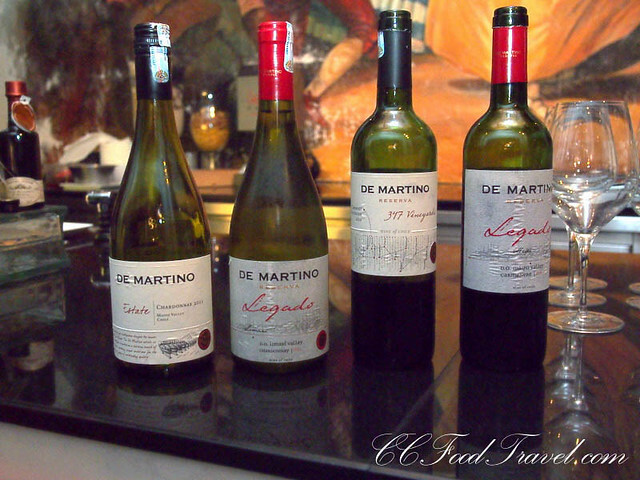 De Martino Winery belonged to the De Martino Family, of Italian origin and back then, it was mainly for exports. It had around 300 hectares vineyard, and located in the heart of the Maipo Valley, no less, and were all managed organically. The Vineyards stretched eastward from Santiago to the Andes and westward to the coast to form three distinct sectors of the Maipo Valley. These wines were supposedly best known for their well-balanced reds. The significance is that Alto Maipo produces some of Chile’s leading Cabernets. Central Maipo is one of the country’s oldest and most diverse productive regions, and Coastal Maipo wines exhibit traits from being grown in cool maritime regions, between the Coastal Mountains. Then Axel told us something that peak my curiosity. The vineyard had something known as Carbon Neutral certification. So what do you mean by organically managed as well as carbon natural, I asked Axel. Well it just means showing respect and care for nature to ensure that in the future they are able to continue producing the same quality of fruit that they produce today, he tells me. 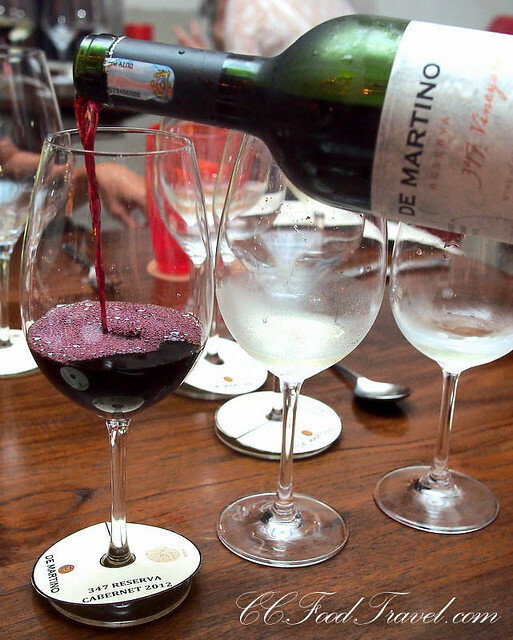 De Martino are certified the second largest producer of organic wines in Chile. The vineyard has also implemented various sustainable practices aimed at reducing said emissions, such as the Water Treatment Plant, a project which allowed them to become the first winery in the world to generate carbon bonds. And in 2009 they reaffirmed their position as leaders in sustainability with two feats: they launched the first carbon-neutral wine in Latin America Nuevo Mundo and Vina De Martino became the first carbon-neutral winery in Latin America. As for the Organic status, the dry conditions in the summer months which characterize their country, as well an almost complete absence of disease in their plants, were factors that made going organic easy. So in 1998 they began the transition from traditional to organic agriculture. After three years they were awarded certification. Well if you ask me, Carbon Netural just means implementing measures to minimise your carbon footprint. And from what I gather from speaking to other vineyards owners that have this certification, it could mean taking measures to reduce the weight of your bottles, while maintaining their functionality and appearance, finding sources of electricity from renewable sources, optimizing packaging, and recycling anything & everything where ever possible, amongst other things. Well, needless to say, we have always been fans of Chilean wines, and when the Straits Wine Company invited us to this Chilean Wine Food pairing dinner, we could hardly refuse. And hailing from such fine vineyards, of course the de Martino wines fared rather well that night with the fine food chosen to pair it with. The huge plus was that they also happened to be eco-friendly wines. The first course was off to a great start. 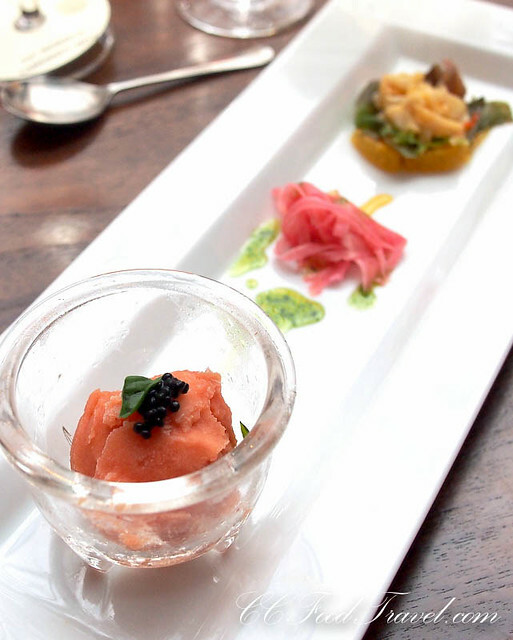 the De Martino Estate Chardonnay 2011 paired nicely with the Antipasti Crudo of Rock Lobster, Orange and Rose Pickled Fennel, Herring Pearl Caviar on Tomato Sorbet. The wine was non-oaky and refreshing. I liked it but found this wine didn’t really make an impression. 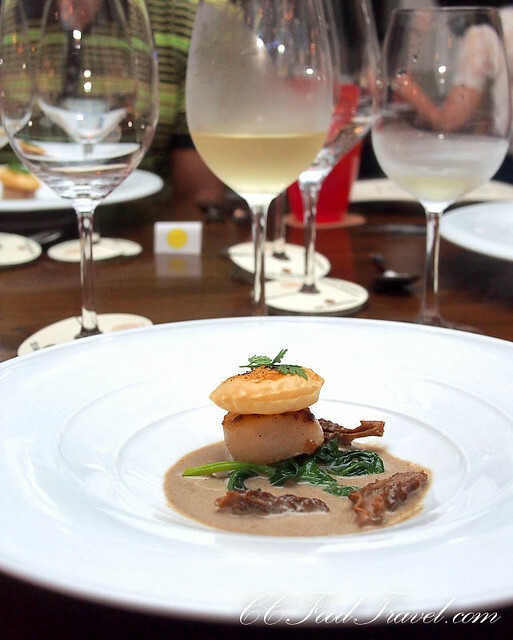 The next course of Seared King Scallops, Morel Cream, Wilted Spinach and Truffle Crisp Filo, was then paired with the De Martino Legado Gran Reserva Chardonnay 2011. Of the two whites, I preferred this one, and it was possibly my favourite wine for the night. On the nose, this wine had a lovely Honeydew melon aroma, and sipping it, I found it fruity and refreshing with nice mineral notes. The enjoyment of this glass of wine has to do with the setting you find yourself in. This wine brings back the memory of a lazy Sunday afternoon by the pool, enjoying good food, wine, and the accompaniment of friends. 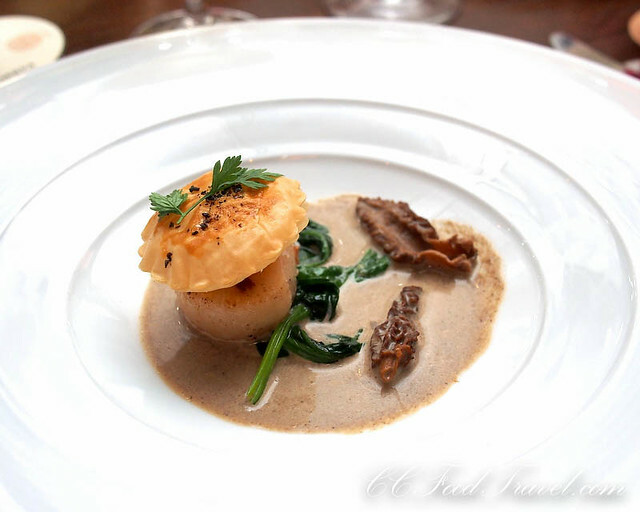 It brought out the flavors in the seared scallop and did the truffle crisp Filo justice as well. I had already hit the high point in this dinner at this point, and we weren’t even half way through. Then it was on the the reds, and we would sample two. Both were supposed to pair with our mains. We should taste each one with our food and see which one we liked. The red we would be sampling tonight were the De Martino 347 Reserva Cabernet Sauvignon 2012, as well as the De Martino Legado Gran Reserva Camenere 2011. 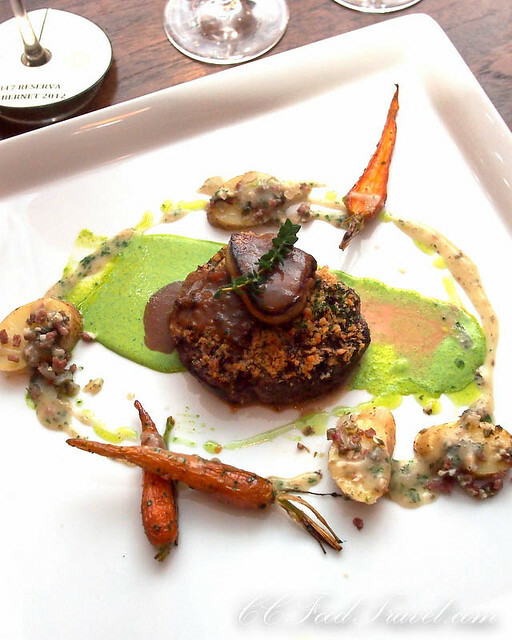 Mains – Beef Medallion, Italian Smoked Sausage and Foie Gras Crust, Boiled Fingerling Potato, Arugula Puree and Charred Baby Carrots. I decided to have the Steak, and Cumi decided to go with the chicken, for experiments sake, we could write about the different experiences. Each mains could be paired with both wines- the De Martino 347 Reserva Cabernet Sauvignon 2012, as well as the De Martino Legado Gran Reserva Camenere 2011. For me, I was pretty confident that both the reds would complement my steak. But what about Cumi’s chicken? As it turned out, Cumi preferred the way the De Martino 347 Reserva Cabernet Sauvignon 2012 paired with his chicken, and I liked the De Martino Legado Gran Reserva Camenere 2011 better with my steak. 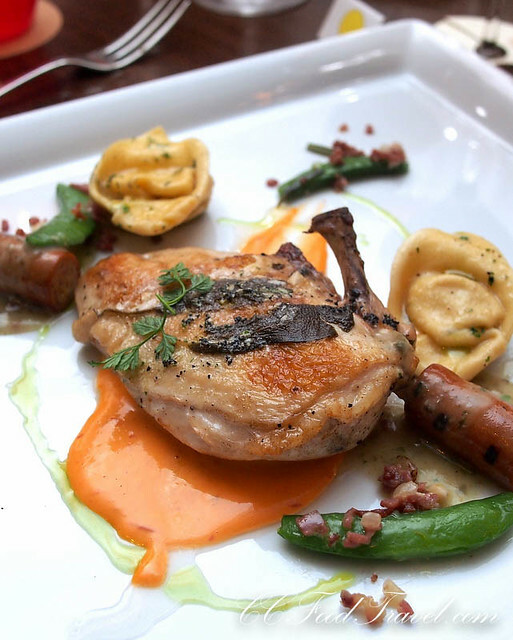 Cumi said he picked the wine that went best with the chicken, and he picked it for its balanced flavour – it had a good harmony of spicy notes and fresh red fruits. It complemented the chicken because wasn’t overpoweringly floral. Instead, it was fresh, full bodied and spicy, with perfectly integrated vanilla and chocolate notes. I on the other hand like the more tannic red, with aromas of black cherry, savoury spices and vanilla notes. 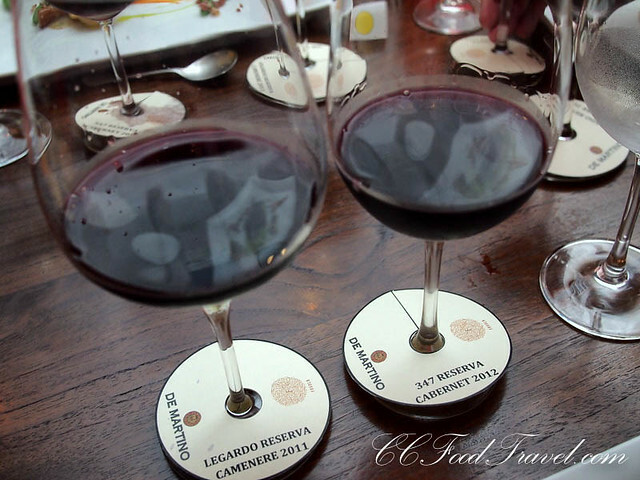 The De Martino Legado Gran Reserva Camenere 2011 definitely had balanced acidity and firm tannins that matched the foie gras and medium rare steak, bite for bite, to perfection. 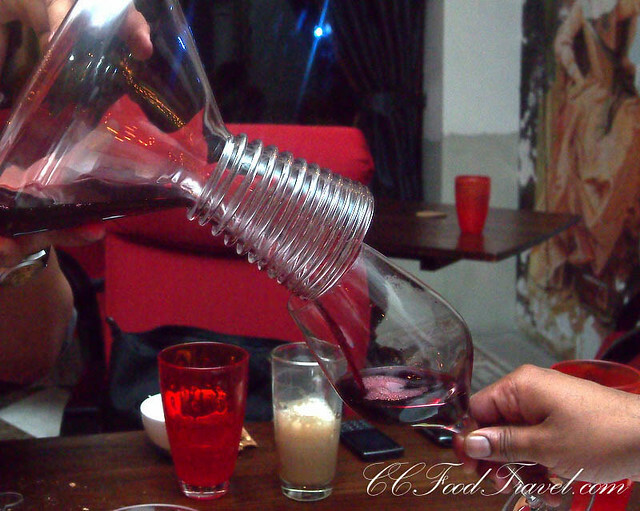 The wine got even smoother with time, once it was decanted and allowed to breath. So we didn’t have to fight over the reds after all. We liked one each! 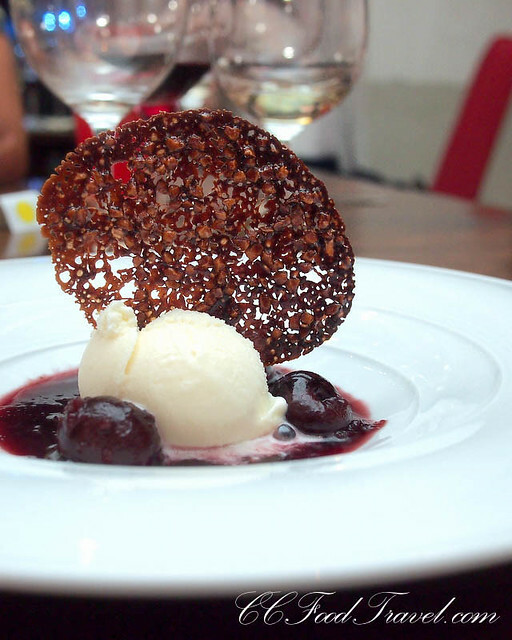 Dinner ended on a high note with a tart dessert of Cherry Soup with Yoghurt Ice Cream and Chocolate Wafer. It was a great night out with Chilean wines for company.. I knew which wines I was going home with that night, so I wasn’t whining. These look gorgeous. And delicious too! 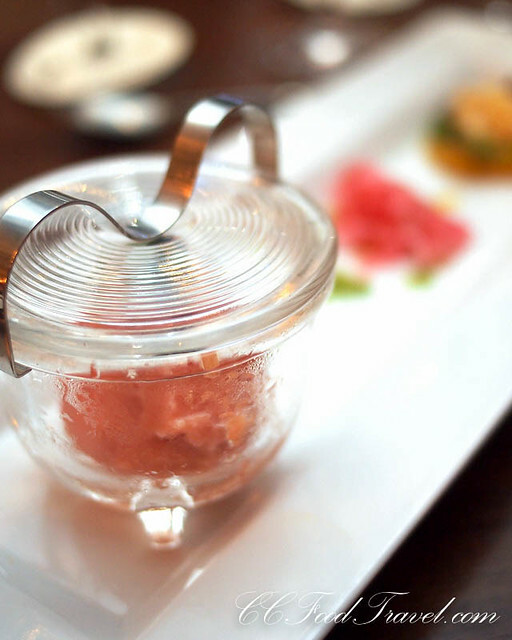 Yes, when you get the wine food pairing right, it’s magic!